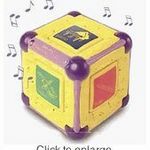 We have had the Fisher Price Peek a Blocks Sing and Sounds Farm for almost 8 years now. We got it for our oldest, and he absolutely loved it. Each of our four kids have played with it over the years. They love the songs that it plays when they put the blocks in. They loved singing along to Old McDonald. Little kids love the spinning windmill, and that they can pull down the barn door to get the blocks out. The blocks that came with the toy were of farm animals, of course. The horse block was hard for little fingers to turn, but they loved the clicking sound when I would turn it for them. The duck block was easier for them to spin around. The pig block has always made us laugh, because there are little brown pellets in the block with the pig, and we could never tell if it was supposed to be dirt, mud, or something else from the pig. The duck in the egg block was always a favorite because it squeaked when little fingers pushed down on the button. Fisher Price makes toys that last, and this farm is no exception. It has lasted a long time, and it was definitely been a loved toy. The peek a blocks farm is a really neat toy. The blocks go in the windmill, and when you pull the door, the windmill spins and lights up, and it plays music. My kids really enjoy it a lot. It came with 5 blocks that were filled with different farm animals. It is well made and durable. That's a big plus when you have two active and curious boys. I really enjoy playing with them with the barn. It could be a little bigger tho, sometimes the kids have a hard time putting the blocks in the windmill just the right way. I like the fact it's like a shape sorter tho. Really good for the fine motor development. I really like the fact that the blocks are very durable, and can be interchanged with other peekablocks products. It's cost-effective as well. A really good product! 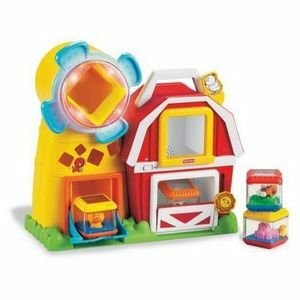 The Peek-A-Block sing and sounds farm is a great addition to my son's peek a block toy collection. 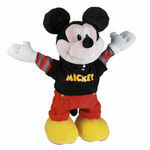 It is brightly colored, has fun music that my son likes to dance to, and is very sturdy. As he puts his peek-a-blocks into the hole, there are two parts on the toy for the blocks to come out of. As the blocks fall down, the music starts. He really likes it when the windmill starts spinning and the toy lights up. He loves listening to the music, although I wish it had a few more songs for variety. After just a few minutes of his playing with it I get really sick of listening to the same songs over and over again. But I suppose that's normal with any kid's musical toy. I like it that this toy adds another dimension of play for his blocks, so he can do more than just stack them up and knock them down. He gets a total kick out of playing with this toy and I like that it can keep him so busy playing but also learning. This toy combines two things kids love: blocks and farm animals. This toy has a lot of fun features and can be suitable for a large age range of children. Our son used it at six months when he was sitting up and the four year old I babysit likes to play with this toy too. Kids love to drop the blocks to the windmill and the barn. The windmill spins and plays a little tune. This toy comes with six animal blocks and it can be used with any of the other peek a blocks. The toy also has a volume control and is not overly loud like many toys out there. It is colorful, durable, and seems to be well made. This toy is also good to help children with their motor skills and putting the blocks into the farm. This toy would make a great gift for a baby shower, kids birthday, or a holiday gift. It is reasonably priced, and I have often seen it on sale. All the kids who come over to our house love to play with this farm. I love this toy peek a blocks farm! This is such a great toy, my son and daughter both love to play with this toy together. It makes all kinds of sounds and plays songs when you put the blocks in and out of the farm.The sounds and songs last for a long time and it does not eat the batteries like most toys do.The flower on top of the tower lights up and spins when you put the blocks into it. The blocks have all farm animals in them and some rattle or do other neat stuff.My daughter likes the cow and duck one the best.My son just started to sit up so this is perfect for him because it doesnt take alot to put the blocks into the farm and they are easy to pick up and put into the farm. The blocks are great for little hands. When they put the blocks in they come out really easy and dont get stuck in it like some toys like this do. We bought some extra blocks to go with this and they fit in to it just fine.This is a great toy that both my kids can play with.